Is your website speaking clearly to your customers? Is your business story easy to share? Maybe it’s time to finally tackle refreshing your website or perhaps making sure that social media tools are well integrated for your customers. But first, you wonder how to speak to your web designer or developer so that what you want is clearly understood. Maybe, you just want to understand what that mumbo-jumbo is that they are telling you. So here are just a few basic web terms that may help you along the way as you build your business on the web. This is the color or image behind the content of a page or area within a page. A type of website that allows you to publish regular content that may include your company updates, images, videos, ect and is very good for SEO (see definition). This is the stuff that sits inside a webpage such as images and text. The nerdy stuff that has to do with how your website looks. Designers & developers use this web language to change colors in a page, text sizes, how the website displays on desktops and mobile devices, and generally anything that affects the appearance of a site. You’ll hear the word styles and style properties often when CSS is discussed. Sometimes a menu bar will consist of buttons or links that contain other buttons or links to different pages on your website or elsewhere on the web. Often when you click or hover over such a dropdown button, another menu will automatically appear below or next to it. The text that is used on a webpage is given a name. There are many different kinds of fonts and font-families that you can pick from. See definitions for serif and sans-serif. See image above. Think of the area at the bottom of a webpage as the footer. It may be an area that contains just the legaleze such as copyright information. Sometimes it is a larger affair that contains a secondary menu bar or other content. Web forms are often used on Contact pages. Visitors fill in a form and typically click on a submit button. Forms often affect web design prices because of the extra coding that they require. An alternative to a contact form is a link that simply opens a visitor’s email client when clicked on and automatically fills in the email address information. Everyone loves photos. Galleries are areas where multiple photos can be viewed by visitors. There are many types of galleries and they will affect website design pricing. See image above. 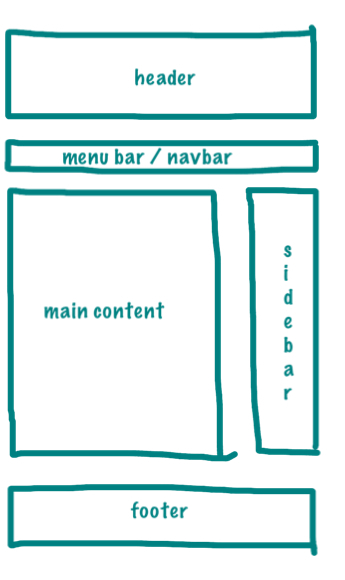 Think of the area at the top of a webpage as the header area. Often this is the spot where you will put your business logo and perhaps company slogan. Often a menu bar is around this area. Different than the page header above, this one refers to the text or images that are used as titles or sub-headings within a page. They are named in HTML as h1, h2, h3, h4, h5 & h6. Generally, an h1 header is designed to stand out from the normal body text and is larger than h2. An h3 header is smaller than an h2 header. These are used to divide up the content of a page in chunks that are easier on the eyes and important for SEO purposes. This is the main page of your website – the first page a visitor will generally reach when they type in your website’s address. This is generally the company that you pay for hosting your website. All of your website files and code live on servers at this host company. GoDaddy and HostGator are examples of hosts. This is the common language of the web. It’s the language that a webpage is written in. You don’t need to know this, that’s why you are paying someone else to handle it. A common scripting language of the web that is used for many different purposes such as achieving special affects. This is the image that represents your business brand. It should be easily visible and typically resides at the top of a homepage. This is the area that contains a group of buttons and links that visitors click on to reach other areas of your website. A message that contains a concise and carefully crafted statement that informs visitors what your business goals, purpose, or values are. A short phrase that captures your brand message. It is often found near a company logo. When you type in a website address (URL) in your browser, you are typically requesting to view a webpage. The homepage is your main website page. Others can include: About Us, Contact, Products/Services, ect. Pretty much a requirement for any new website. A responsive website will adjust to various screen sizes and devices. Due to the extra development time and costs, these types of websites will cost more than non-responsive sites. A type of font-family that is characterized by text characters which don’t contain little wing-dings or projections at their tips. Arial and Helvetica are examples of typefaces that are sans-serif. Search Engine Optimization represents many things. It’s an effort to craft a website that is easily and accurately found by search engines. Best practices often include the use of various coding techniques and site layout considerations. You will often hear the phrase ‘key words’ when talking about SEO. Understand that this is a constantly changing thing and can require considerable time to properly plan and implement. A type of font-family that is characterized by text characters which contain little wing-dings or projections at their tips. Times is a serif font. This refers to an area of a website that allows visitors to select products or services for purchase. See image above. This area is often used to display content that is not necessarily part of the main content message of a webpage. It might be on the right or left side of a page. A type of image gallery that typically is prominent on a webpage and that may automatically scroll between images with special effects. These are the small images or links that are used to connect visitors to your social media pages such as Facebook and Twitter. This is a spot on a webpage that contains your customers’ praise. It helps spread the love. These are embedded areas on a webpage that can contain things like your Twitter feed, Facebook feed, maps, ect. I’ll try to bring out a social media speak blog soon as well. Thanks for stopping by. Also, do not worry if the lingo is too hokey-pokey for you. I also speak English.